breathtaking view, try Barry’s Restaurant. ex-pats; he is yet to be discovered by Egyptian diners. 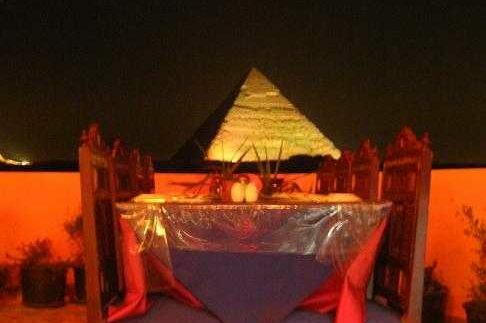 restaurant are less authentic and more catered to what tourists would expect to find in an Egyptian restaurant. set group menu for 200LE a head, while an à-la-carte option is also available. 20LE, none of which are particularly special. desert night wind had most of us shivering in our thin summer jackets. hefty bill that comes at the end of the meal. Possibly the most breathtaking view of the pyramids; this restaurant is highly recommended for an alternative romantic dinner or for a dinner party with friends. 200LE per person without drinks is hefty considering the portions and quality of food. 80LE for a coke and a cup of tea was also ridiculous; these are tourist prices.